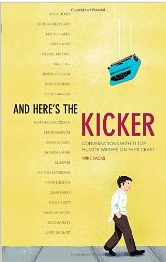 I recently finished a great comedy book, “And Here’s The Kicker: Conversations with 21 Top Humor Writers On Their Craft” by Mike Sacks. I got a ton of useful quotes from it, so this will be a rather long series of posts. I recommend buying the whole book, as there is a lot of insight inside. Since the book is interview style based, I’ve put the writer’s name above all of the quotes that are attributed to him. Q: Do you have a target audience in mind when you write?